Do you have to live in Maine to write a Maine cozy? Apparently not. In some cases, it appears you may not even need to have visited the state. Let me backtrack for a minute. I recently came across a blog site devoted to the cozy mystery (http://www.cozy-mystery.com). It contains an assortment of lists of cozy mysteries arranged in a variety of ways, including the state in which they are set. On the Maine list are Donald Bain (with “Jessica Fletcher”), Jennie Bentley, J. S. Borthwick, Claire Donally, Kaitlyn Dunnett, Cynthia Gallant-Simpson, Sarah Graves, Linda Hall, B. B. Haywood, Lee Hollis, Margaret Lawrence, Karen MacInerney, Leslie Meier, Meira Penterman, Virginia Rich, and Lea Wait. Right off the bat, I could think of other writers who should be added. But what struck me even more forcibly was the fact that I’d never heard of Claire Donally, B. 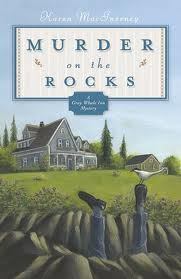 B. Haywood, or Lee Hollis and didn’t know that some of the others I had heard of wrote mystery series set in Maine. Out of curiosity, I decided to try to find out a little more about these folks and their mysteries and share the results of my research here. I didn’t take on the whole list. I limited it to match what MCW contributors Vicki Doudera, Sarah Graves, Katherine Hall Page, Barbara Ross, Lea Wait and I write: ongoing series (a new entry published in 2013 or scheduled for 2014) in the cozy/traditional mystery genre, set all or in part in Maine and published by royalty paying publishers. Because they are in a category all their own, I left out the Murder, She Wrote novels. I have not read any of the titles I’m about to mention, although I plan to dip into each of these series in the future. All I’m going to do here is pass on what I found out about them and their authors and leave it to readers who already enjoy the books Vicki, Sarah, Katherine, Barb, Lea, and I write, to decide whether or not to sample them.Vicki, Sarah, Lea, and I live in Maine year round. Katherine and Barb are summer residents. It’s pretty easy to understand why we chose to set some or all of our books in Maine. As you’ll see, there’s a bit of a mystery as to why some of the following writers made that same decision. It’s impossible to tell if they’ve ever visited Maine, or why they chose to write a series set here. 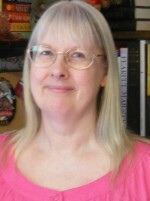 Jennie Bentley (a pseudonym) writes the Do-it-Yourself Mysteries. Avery Baker, a New York designer, inherits a cottage in Waterfield, Maine and moves there. The first title is Mortar and Murder. The author lives in Nashville, Tennessee. Claire Donally (a pseudonym) writes the Sunny and Shadow Mysteries featuring Sunny Coolidge, a reporter who left NYC to care for her father in Kittery Harbor, Maine. A cat, Shadow, is a major character and there are apparently scenes written in the cat’s point of view. The first title is The Big Kitty. No biographical information is available on this author at the publisher’s site, Amazon, or Goodreads. B. 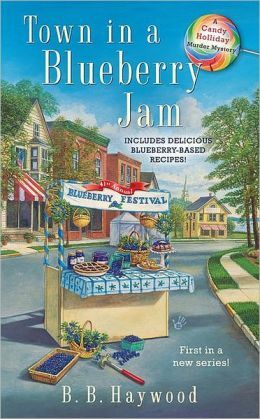 B. Harwood (a pseudonym) writes the Candy Holliday mysteries, starting with Town in a Blueberry Jam, set in Cape Willington, Maine. The authors are Beth Freeman and Robert Freeman, who got the idea for the series while driving around Maine. Their website (http://www.hollidaysblueberryacres.com) does not include a bio or say where they live. They do give a credit to Merrill Blueberry Farms in Ellsworth. Lee Hollis (a pseudonym) writes the Hayley Powell Food and Cocktails Mysteries set in Bar Harbor. Details were hard to track down, but it turns out that this series is written by a brother and sister who were born in Bar Harbor. Rick Copp is also a successful screenwriter. His sister, Holly Simason, still lives in Bar Harbor and is a columnist for the Mt. Desert Islander. The first title is Death of a Kitchen Diva. 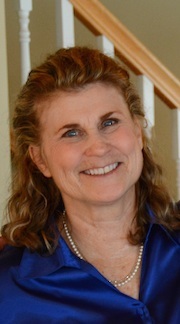 Karen MacInerney writes the Gray Whale Inn series featuring Natalie Barnes, a woman from Texas starting over in Maine. The first title is Murder on the Rocks. The setting is Cranberry Island. The author lives in Texas, but she was in Bar Harbor just last month and wrote about it in her blog. 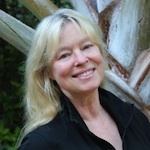 Leslie Meier has been writing her Lucy Stone series, set in Tinker’s Cove, Maine since 1991. The first title was originally Mail Order Murder. It was reissued as Mistletoe Murder when the series was revamped to have every book feature a holiday. The author lives on Cape Cod and doesn’t mention any Maine connection in online bios. 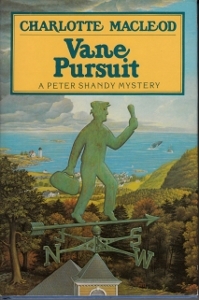 Although it doesn’t meet my criteria for this post, I have to mention that I recently reread Vane Pursuit (1989) by the late, great Charlotte MacLeod of Durham, Maine. It is partially set in Sasquamahoc, Maine and features a mystery novelist named Catriona McBogle as an important secondary character. When asked how she likes living in Maine, Catriona replies that she loves it because “you can be as insane as you please and nobody pays the least bit of attention.” I’ve got to agree with Catriona (and Charlotte) about that. So, now it’s your turn, faithful readers of this blog. Have you read any of these writers? Care to comment? And if any of the writers I’ve mentioned in this post would like to chime in, or contribute a guest blog on “Maine,” “crime,” and/or “writing,” we’d love to hear from you. This entry was posted in Kaitlyn's Posts and tagged B. B. Haywood, Barbara Ross, Claire Donally, cozies, Donald Bain, J.S. Borthwick, Jennie Bentley, Kaitlyn Dunnett, Karen MacInerney, Katherine Hall Page, Lea Wait, Lee Hollis, Leslie Meier, Maine cozies, Maine writers, Murder She Wrote, Sarah Graves, Vicki Doudera. Bookmark the permalink. 21 Responses to Do you have to live in Maine to write a Maine cozy? I can remember reading Town in a Blueberry Jam, and the recipes. If I remember correctly it is about a gal coming home to help her aging Dad with the farm and getting involved with a mystery. I know there are more in the series, but I have not yet returned to it. That raises another question, about the tendency of cozy mysteries to include recipies or helpful hints or trivia. I was asked if I wanted to include recipies in my Liss MacCrimmon Scottish-American Heritage series and I said no. Liss’s idea of cooking is to throw something in the crock pot or fry up a hamburger or, better yet, go out for a pizza or Chinese food. And, of course, you really do not want to read the directions for making haggis!! I’ve read most of Leslie Meier’s stories and thought she had a really good grasp on the tensions between long-time and newbie residents. Her books resonated with my experiences of living in Raymond ME for 5 years…. though if she actually lives on Cape Cod, she’s experiencing much of the same new/old conflict there, too. And I think the books are excellent representatives of the cozy; well-developed, believable characters, reasonable plots, not too much gore, authentic engagement with ethical issues. Thanks for your feedback Virginia. I’ve never been to Cape Cod (except by way of Lea Wait’s most recent Shadows mystery), but I expect you’re right about there being many similarities to parts of Maine. I like Leslie Meier’s books a lot. I asked her once, “why Maine?” and she said she was young and naive and it seemed like a romantic place to set a mystery. I agree with Virginia that living on the Cape, and seeing life in a harbor town, probably informs Leslie’s books pretty well. I haven’t read Karen MacInerney yet but after she appeared here on the blog, I bought one of her books and plan to read it soon. I found a blog interview with Jennie Bentley where she says she’s never been to Maine. Her fictitious town is in my neck of the woods, so I may have to try one out. There is one series listed above which I have tried to read. And tried. And tried. And just couldn’t get through it. To me, it was “generic small town” fantasy with the usual whacky cast. No hint of Maine-ness. I couldn’t get through the first book. It’s an interview with Karen conducted by Lea Wait back in June. I’ve read the Karen McInerney and B. B. Haywood books. I’ve enjoyed them & I do track when a new one comes out. I’m under the impression that Karen grew up in the Northeast and even lived awhile in Newfoundland. I also think she visits Bar Harbor and Cranberry Island in the summer. I was surprised awhile back to learn that B. B. Haywood & her husband write her books as a team and do not live in Maine. But the books seem well informed about life in blueberry country. She apparently has a contact at Merrill Wild Blueberries. She & her husband may have more exposure to Maine than we can determine. A book that was a major success about Maine was Empire Falls. My guess is that Waterville, Maine was loosely Empire Falls. I was very irritated by it & I felt it was a typical “outsider’s” view of Maine people. It didn’t ring true to me. Whereas I’ve felt no conflict like that reading Karen’s series or B. B. Haywood. I guess some authors have better instincts than others about the people & culture of an area. I suppose that people with good instincts can get an accurate read on an area & its people even from one visit. So their books will ring true. Others can relocate to an area & live there for years and still not get it right. Lea, by the way, gets Maine right. I love that she gets Maine and New Jersey right as I love both states. Great insight, Mary Anne. Thanks for your comments. What a fascinating post, Kaitlyn. I’ve heard of Jennie Bentley. Believe she’s a member of the Kiss of Death online RWA chapter. I seldom read cozies, so I can’t comment on how her books or the others portray the folks in who inhabit your fair state. I think it was on a visit to Camden, I was talking to an old timer about the weather and pollution. Coming from North Central Texas where you can hardly see the downtown skyline because of the gunk in the air, I was totally unaware there was any kind of problem in Maine with pollution. Comparatively, your air is really pure. 🙂 The bigger surprise was this gentleman who’d grown up in the town had only a hint of what I call, “that delightful” accent, traditionally expected from Maine natives. I have a pretty good ear for accents, and occasionally it was very broad, but most of the time not. Did I observe something fairly common or was the gentleman an oddity? Thanks for input and for having such a fun blog. I live in and write about an area a good two hour drive from the coast, but my impression is that there aren’t many people left with a Down East accent anymore, unless they put it on for tourists or have avoided watching television for the last fifty years. 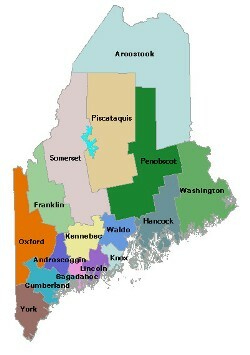 But it’s a big state, and there are a variety of “Maine” accents, some of them very local indeed. I’ve yet to hear “ayup” or “finest kind” in real speech, but I have heard a lot of things called “wicked good.” For a local boy’s take on Maine humor, with only a slightly exaggerated accent, look for a recording by Tim Sample while you’re here. I love Charlotte MacLeod’s books, and the way you all take me to the Maine I once visited. I also must confess that I have a suspension of belief, so if the book is written well, I’ll accept what the author tells me. I do think f you live there, it’s in your bones, so to speak, and that comes through. Good idea for a post, K! I have not read any of these folks, so I’ll have to get busy. When I was pitching a cozy mystery set in England, the agent told me I couldn’t possibly write a book set on the coast of England if I lived in Texas. She suggested I change the location to a Texas town. As I was born and lived in England for many years, it didn’t take me long to realize that it would be impossible to simply change the town names. Obviously the descriptions of an English coast and Texas ranch country are very different. It’s good to see that Murder on the Rocks was written by a Texan (obviously her agent wasn’t as short sighted). The descriptions were wonderful and the author obviously knowledgeable of the area. Thanks for sharing your story, Ann. And to other folks reading these comments, don’t forget to click on Ann’s name above to go to her webpages and learn more about her books. 4 years later and 12 books I am happy with our progress and thankful for the people who read us! We are And were not not lucky enough to have been invited into one of these “Maine writing Groups” from out of state. But being true Mainers and writing from our hearts we cheer everyone on and congratulate your successes. Cheers to you and to more Cozy Mysteries written from our hearts & Maine. Thanks, Holly. I hope we have a chance to meet one of these days. I’ve never been to Maine and most of what I know of Maine I’ve learned from reading MCW books. I’ve read at least one book by each of the authors you mention, with Leslie Meier, Karen MacInerney, and Lee Hollis being among my favorites.